US President Barack Obama met with South African President Jacob Zuma Saturday morning at the grand Union Buildings in the capital Pretoria, where former President Nelson Mandela was inaugurated as the country’s first black president in 1994 after 27 years incarceration under Apartheid. Obama said his message during the visit will draw on the lessons of Mandela’s life, with a message that “Africa’s rise will continue” if its people are unified instead of divided by tribe, race or religion. “Our thoughts and those of Americans and people all around the world are with Nelson Mandela and his family and all of South Africans,” Obama told reporters at a joint news conference. Zuma and Obama discussed several crucial issues, including trade, investment, US commitment to Africa and democratic developments in the continent. “We are pleased to be working with you today with a common goal of expanding trade and relations between our two countries,” Zuma told Obama during the press conference. 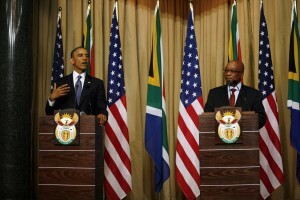 The US is a major trade, investment, tourism and technology partner for South Africa. There are 600 American companies in South Africa, employing more than 150,000 local people. Former South African ambassador Y Abba Omar told The BRICS Post that officials in Pretoria see Obama’s visit could reinforce the strategic partnership between the two countries. “The overall message is that the US is a ‘strategic partner’ as stated by Minister of International Relations and Cooperation, Maite Nkoana Mashabane. Or, as the Minister of Trade and Industry Rob Davies put it, ‘a key trading partner’,” Abba Omar says. The former ambassador says Zuma’s delegation will likely pressure the Americans to continue their commitment to the 2000 African Growth and Opportunity Act (AGOA – which offers incentives for African economies to build free markets) and South Africa’s inclusion in it. Obama said he supported moves to improve and renew AGOA and would first have to convince the US Congress to approve the extension of the Act. Obama also pledged to boost trade with Africa and plans to renegotiate an African trade pact to improve it for American businesses. He said he welcomes competition from other nations who have been aggressive in pursuing commercial opportunities in Africa, including China. Obama is on a three-nation tour of Africa. He arrived from Senegal on Friday night and is expected to leave South Africa for Tanzania on Sunday evening. The White House says that Obama – accompanied by his wife Michelle – met privately with Mandela’s family on Saturday. Obama is also scheduled to meet with young people in Soweto, the scene of the 1976 student protests against the racist apartheid regime. He will also deliver a speech at the University of Cape Town. Earlier, hundreds of people gathered in Pretoria to protest Obama’s visit, demanding that the US roll back its aggressive policy “against humanity”. The protests were organized by the ‘No You Can’t Obama’ Campaign (Nobama), the South African Communist Party, and the Congress of South African Trade Unions.